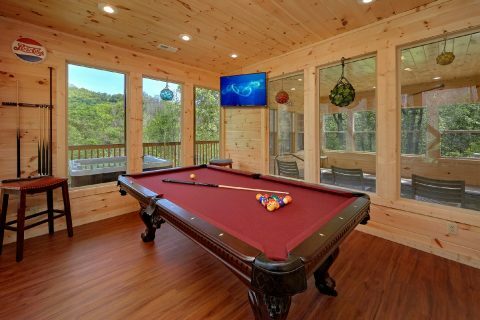 Welcome to "Scenic Mountain Pool," an impressive 2-bedroom cabin with an indoor pool that's close to Dollywood and Downtown Pigeon Forge! 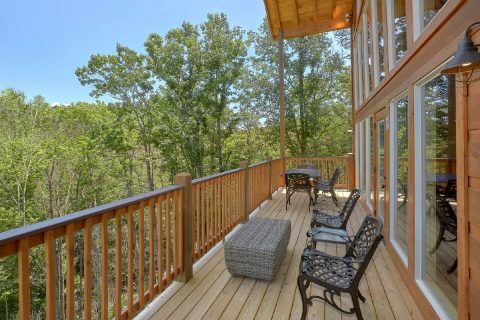 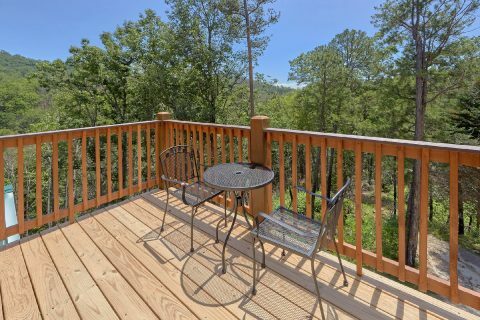 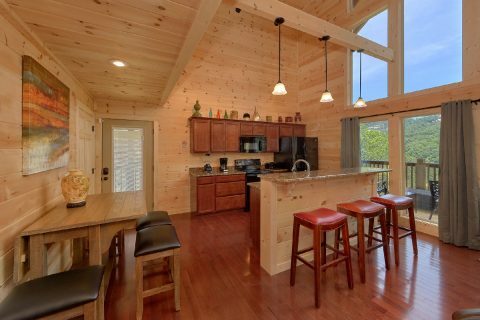 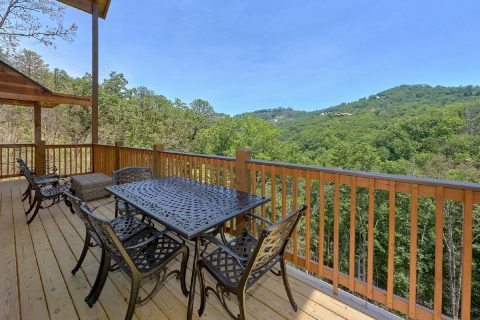 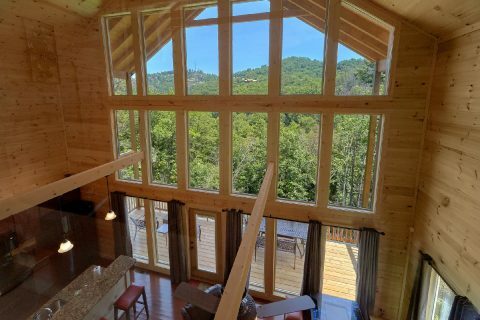 This premium log cabin with mountain views is only 4.3 miles from the action-packed Pigeon Forge Parkway, so guests of this rental can enjoy quick access to top attractions like The Historic Old Mill, The Island, and Dolly Parton's Stampede! 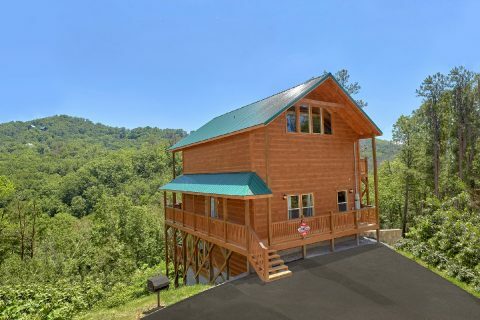 When you aren't busy exploring Pigeon Forge or hiking to overlooks in the Great Smoky Mountains National Park, you'll love unwinding at this beautiful cabin that's only a short drive away. Inside "Scenic Mountain Pool", you'll find a welcoming living area that's perfect for spending quality time with family and friends. 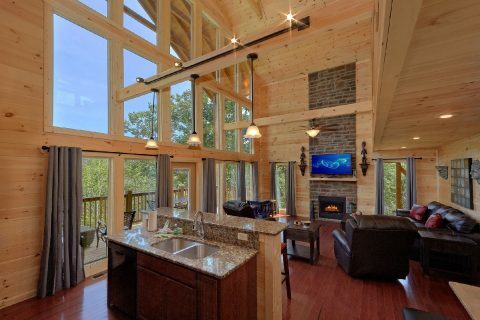 This living room comes complete with a television, comfortable furnishings, and stylish touches like an elegant floor-to-ceiling gas fireplace and vaulted ceilings. 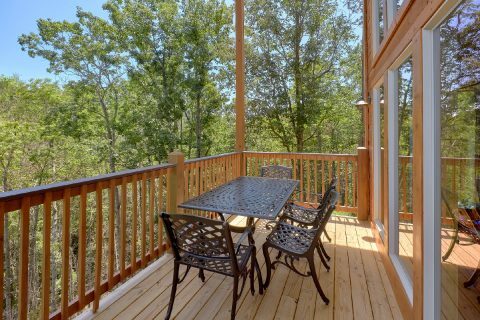 From here, you can access your cabin's deck with a table and chairs to enjoy your cabin's stunning mountain view. 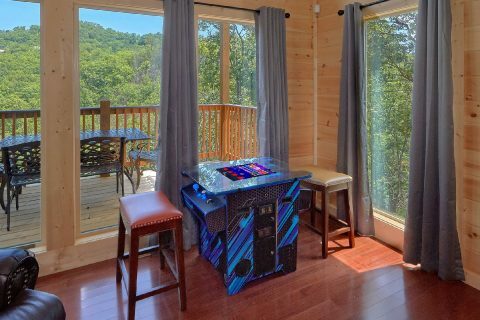 For some in-cabin entertainment, you can always head downstairs to your cabin's game room area that features an 8-ft. pool table and a 64-game arcade game. 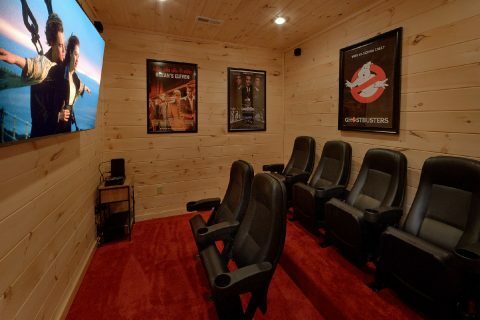 Nearby, you can watch your favorite movies in style in this cabin's theater room for an unforgettable movie night in the Smokies. 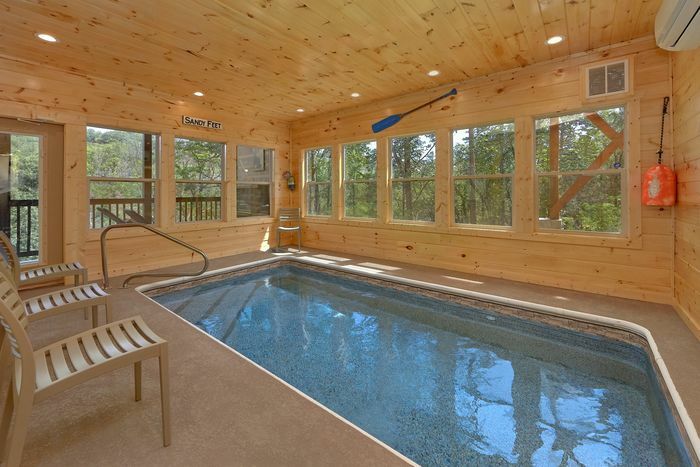 Your cabin's private indoor swimming pool is also located on the lower level for year-round swimming fun! 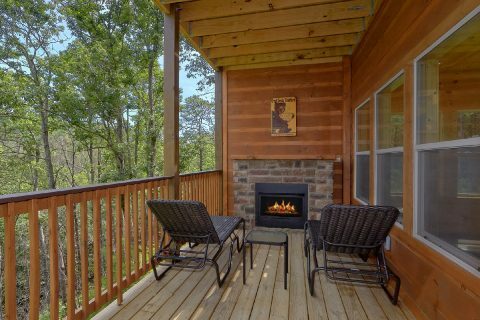 Step outside to the lower level deck to relax in the great outdoors in the warm waters of the hot tub or simply sit in a comfortable chaise lounge and warm yourself by the outdoor gas fireplace. 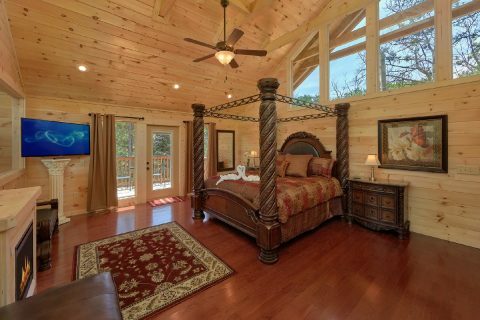 Once you're ready to get some rest, you can look forward to sleeping in one of this cabin's 2 king-size bedrooms. 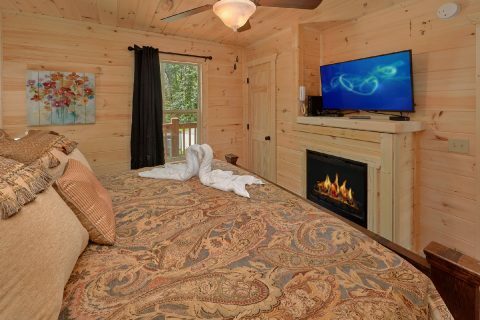 The main floor is home to a bedroom with a king bed, an electric fireplace, and television. 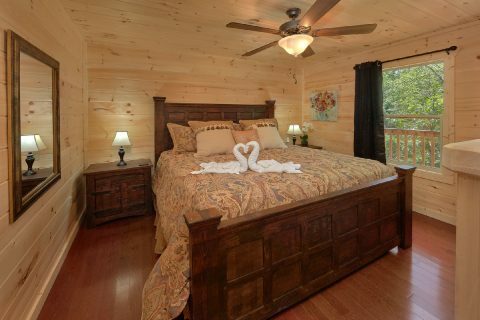 Upstairs, you'll find this cabin's master suite in the upstairs loft tha is enclosed in glass for added privacy. 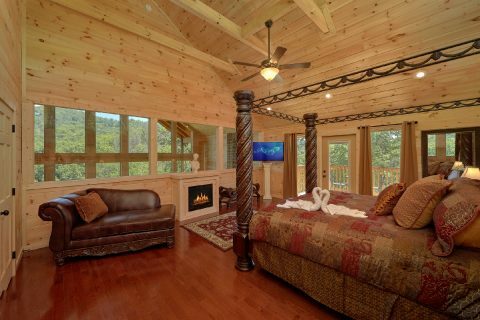 The master suite offers excellent views of the mountains as well as an in-room electric fireplace, a television, and a private upper-level deck. 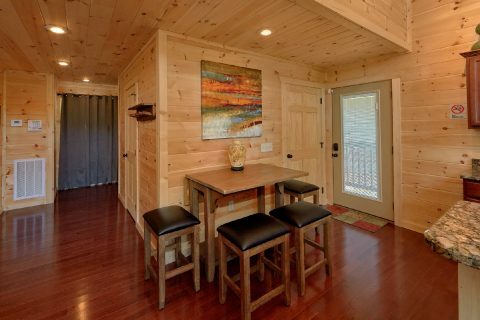 With a sleeper sofa in the living room, this cabin comfortably sleeps up to 6 guests. 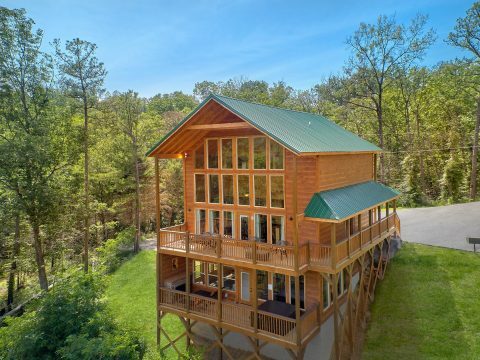 If you're in need of more accommodations for a large group vacation, Cabins USA Gatlinburg offers several other nearby cabins that can be reserved together. 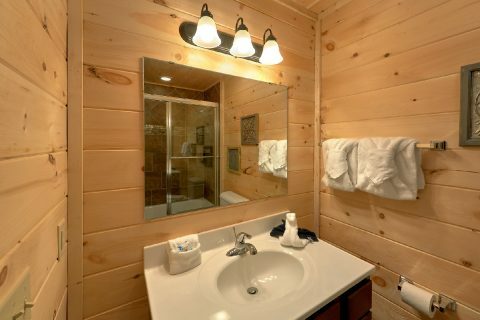 Simply contact our reservations office to start planning your multi-cabin vacation in the Smokies! 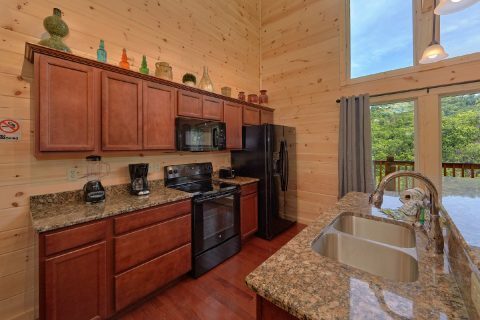 This cabin also features practical amenities like a kitchen with an island for preparing delicious meals during your stay. 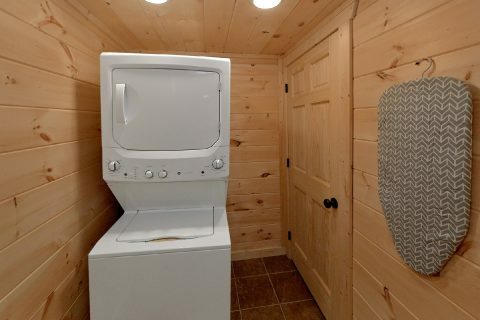 This cabin also boasts its own laundry room, and it offers parking space for two vehicles. 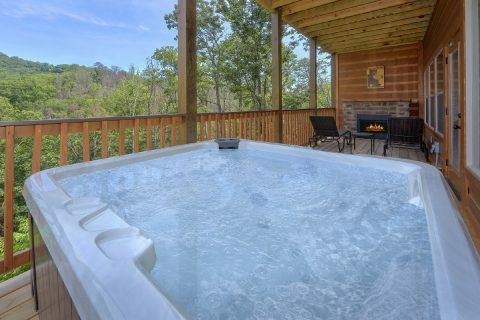 Book this premium cabin with a view and a private pool today with Cabins USA to save 15% on your nightly rate in the Great Smoky Mountains!